Gluten-free certainly is a buzzword these days, but there are sooo many gluten-free products out there that are made of processed junk, as Lisa has touched on in the past. But two of my girls are gluten-free, both for various reasons. For my 13-year-old, I noticed that her acne was much better when she didn’t have gluten. And my 8-year-old is admittedly “crazy” as she calls it (somewhat hyperactive), when she has it. It certainly makes life interesting in our house since the other two have no issues with gluten, and it keeps me on my toes when it comes to baking. I strive for them to all have options of yummy foods, which is exactly what these chocolate chip cookies are: gluten-free but full of taste. So here’s the thing with baking gluten-free: it needn’t be daunting. Two years ago when my (now) 8 year-old stopped having gluten, I was apprehensive of what I’d be able to feed her. No bread? No muffins or scones or pancakes? Could I even bake her a birthday cake on her birthday? I’m here to tell you that yes, it’s absolutely doable. And while I’ll admit that there is not a great exact replacement for a croissant or a bagel (in my opinion), there are some wonderful foods that are just as satisfying. 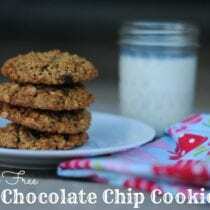 Enter these really yummy gluten-free chocolate chip cookies. 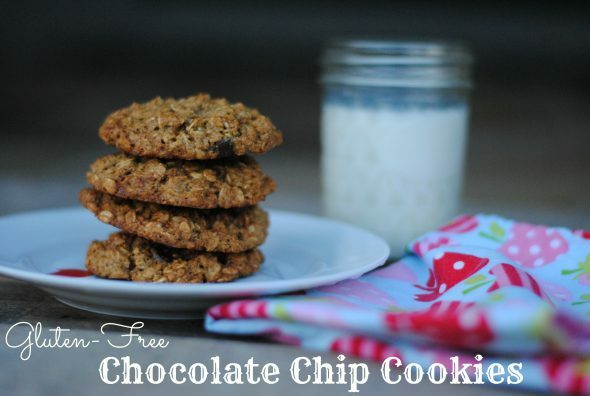 I love to bake, and while they are certainly not an everyday (or every week) thing, my kids love chocolate chip cookies (ahem – so do I) ;). I believe in moderation and also in occasional treats. I wanted a recipe that didn’t contain gluten, yet tasted every bit as good. And I honestly couldn’t believe it when my kids all gave these a 9 1/2 out of 10. Happy day! And a rare one, at that. I really, really hope that you’ll give these a shot, whether you can or can’t eat gluten. Before I get to the recipe, I want to mention my favorite way to really sit relax and enjoy these treats. I’m not the best at slowing down, so I try to make it a point to pour a nice cup of tea and to take a few minutes for myself – you know, mindfulness is such the thing these days. You have probably seen my posts about Traditional Medicinals in the past, my tea brand of choice. I favor them because of their commitment to quality; their herbs are not only all organic when possible, but they are pharmacopoeial grade – something that matters to me. Their trained herbalists create blends that are work wonderfully together, such as their two new blends – Tulsi with Ginger, which helps support a healthy response to stress without slowing you down, and Rose Hips with Hibiscus, which is fruity and tangy while also refreshing. I personally am a huge ginger fan so I’ve been enjoying the Tulsi with Ginger with these cookies. You can find out more about Traditional Medicinals here. You’ll notice that this recipe calls for egg yolks. I added these because they add richness and depth in addition to acting as a binder. I used 3 different types of sugar, but this is because I had all of them on hand. You can certainly try the recipe with 3/4 (total) cup of one of the types of sugars, or use use 1/2 cup brown sugar and 1/4 cup white sugar if you don’t want to go out and buy another ingredient. To make oat flour, simply pulse the oats in a blender or food processor until they are ground into a powder-like consistency. This should take 60 seconds or less. Stop and stir to ensure that all the oats have been finely ground. 1 cup of rolled oats will yield approximately 1 cup of oat flour. Make sure that they are gluten-free if you are going for a GF final product. These are our favorite chocolate chips for baking. Ingredients are minimal and they taste great, too. 1/4 cup chocolate chips, heaping! Preheat oven to 375 degrees F. Prepare a baking sheet (I like to use parchment paper). Mix dry ingredients (oat flour, oats, baking sugar and sugars) in a medium-sized bowl. Make a well (hole) in the middle and add melted butter, egg yolks, vanilla and milk. Stir to combine. Fold in chocolate chips. Place batter in the refrigerator for 15-30 minutes. Batter is somewhat wet - don't worry! Using a cookie scoop or spoon, scoop out rounded Tablespoon amounts of dough, roll them into balls and place them 2 inches apart on a baking sheet. Bake for 9-11 minutes. Let cool before enjoying. So tell me, are there any other divided families out there? Do you end up cooking various foods to suit different preferences? I’d love to hear about it in the comments below! I recently had to become dairy free, along with having been gluten free for several years now. Would almond or cashew milk (I make my own) work in this recipe as a milk substitute? Yes, you can use a nut milk. These sound delicious! Thank you not only for the recipe but also for the tips on making oat flour, Kiran! I love that these cookies are gluten free without having some of those more difficult ingredients such as xanthan gum or guar gum. its look sooo yummm…amzing receipe.. These look very similar to the GF monster cookies I make for my MIL. I will have make a batch of these to bring down the next time we see her. For those of us who have to live gluten free, we appreciate you sharing the recipe. I have that “gluten free” seems to have a negative connotation for some people. It really shouldn’t. We don’t stigmatize diabetics who have to watch their starch/carb/sugar intake. We shouldn’t stigmatize others with food allergies or issues either. Food is our bodies’ fuel. Some of us just have different requirements than others. This looks like a great recipe. Thank you! Can you just make out flour by putting the oats in a food processor? one of my sons has a gluten intolerance, he gets a bad, itchy rash if he eats gluten, so we have been using oat flour for everything, it’s easier.